Pocketful of Borders: Hey, Diddle, Diddle! The next border to finish up for Pocketful of Posies: A Traveling Exhibit is the illustration for the rhyme, “Hey, Diddle, Diddle!”. The new book includes all of the rhymes from my board book series, but they are represented by new illustrations. I really liked compressing the scene into one image, instead of stringing out the action over several pages. 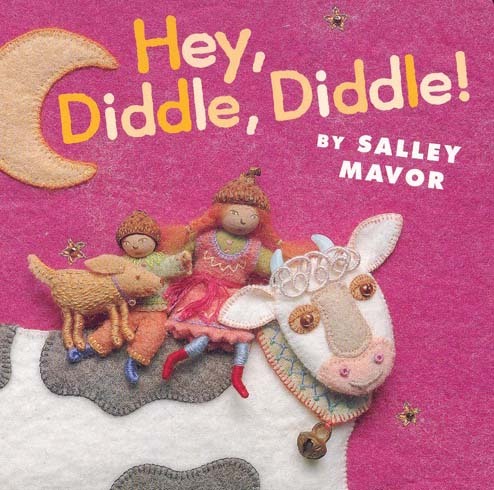 Most of the main characters from “Hey, Diddle, Diddle!” are similar to the ones in my board book version, with the exception of the cat, which is made in a different style. The plate is made from polymer clay and the spoon is a doll house miniature. cat from "Pocketful of Posies"
The new book, Pocketful of Posies: A Treasury of Nursery Rhymes includes many cats made in my new Halloween costume style. The head is a wooden bead, with face painting and a felt hood with ears attached. The cat’s paws and chest are whitened with acrylic paint. The fiddle is felt, with a thread-wrapped wire neck and bow. The illustration’s existing brown border was wide enough to cut in a wavy pattern, so I didn’t add another felt border. After several tries with different colors, I chose a blue pima cotton for the blanket stitched edging. I then embroidered my initials and the date with some variegated dark purple raw silk thread. It called out for embellishment, so I started doodling along the border with light blue raw silk thread. The light blue line lacked contrast, so I outlined it with a single strand of orange embroidery floss. For the corners, I added spirals and unintentionally doodled a pattern in the Celtic style. After outlining a few sections, I decided that the orange floss attracted too much attention, so I ripped it all out. That’s what is so great about stitching, you can change your mind mid stream. Borders, like any kind of framing, should compliment the artwork, not compete. I thought that a little height and firmness would perk up the border, so I added 32 gauge florist’s wire to the outside edge. I then covered the wire with 2-ply orange/red variegated embroidery floss. At this point, I was glad that I’d removed the orange outline around the doodles and saved the color for the outside edge, which defined the border against the upholstery fabric background. I bent the wavy wire so that it lifted up the outside edge. Here is the finished “Hey, Diddle, Diddle!” piece, ready to frame for the traveling exhibit of original art. My husband, Rob, has been making shadow box style frames in the basement. He’s doing a beautiful job and the 51 cherry wood frames are about half way done. We are both making progress toward the Sept. deadline for the first show in Falmouth. This entry was posted in Animals, Children's Books, Fabric Relief, Felt, Inspiration, Pocketful of Borders by Salley Mavor. Bookmark the permalink. Fabulous cherry boxes for your work! My own husband has filled our home with cherry paneling and Shaker furniture that he has made. We are so LUCKY to be married to skilled woodworkers–even though that is not their actual professions. Those shadow box frames are drool-worthy! Well, the new book is on pre-order for ME. I have given away Mavor books for years as gifts and the only Mavor book I have here is the Wee Felt Folk. I cannot wait to receive the new book–and see the exhibition when it comes to UCONN. I am worse than a kid! Thanks for sharing the process. The Cat and the Fiddle are just perfect! This is all so beautiful – the little cat’s face and his violin, the deep blue sky and flying cow. Do you have a list of the places this will all be seen? I haven’t tried Canada and would appreciate any contacts at museums up north. I can almost hear the music from the Cat’s violin, this piece of your inspired needle-art is a great example of your abilities to astound us all with your beautifully wrought artworks. How fortunate you are to enjoy the support and talents of your husband in crafting the cherry wood picture display frames that will accompany your traveling Pocketful of Posies exhibit. Mary, soon you and your grand daughter will be looking at the book, which you can preorder from Amazon. Click on the book title in the post and there will be a link. The orange outside border just makes it pop off the tapestry fabric. I just love that adorable little spoon LOL! What a nice hubby you have to make all those boxes. Seeing all this artwork come together is amazing- 51 framed pieces- WOW! I can’t believe this fantastic body of work! Wow, that border was wonderful! Oh, the SPOON and this dish, the adorable cat wearing it’s kitty ear hat..so darling!!!! Can’t wait to see all this soon!!!! What a job your husband is doing…amazing! 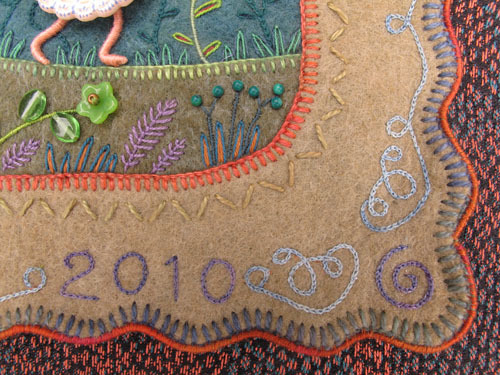 What yummy stitches in this border. The cherry boxes will be perfect with your work, too!